Paris was slated to have a big windstorm because of the storm going across the north, but, luckily it wasn't too bad here. There was a lot of rain and wind in the morning, but in the afternoon, the sun broke through as I was walking back to my hotel. 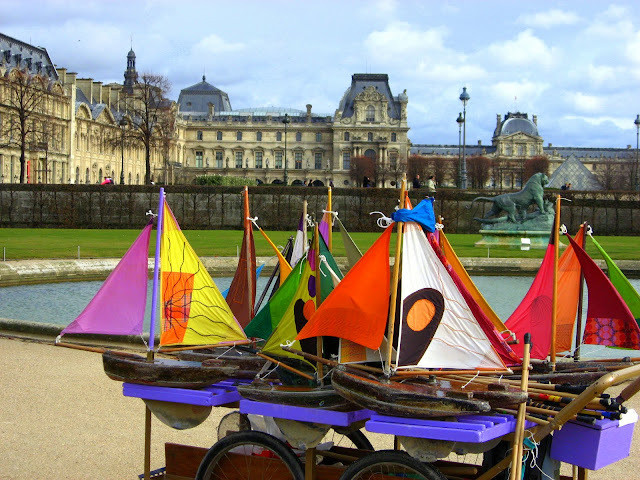 I was coming from the Left Bank (rive gauche) and decided to walk through the Tuileries Garden (next to the Louvre). Despite the light rain that was falling and the "breeze" (my umbrella was not happy), there was still a fair number of people out enjoying a walk on a Sunday. It's such an unexpected sight next to the Louvre! Love it!